Published in the South Kent Gazette, 1 October, 1980. The new way to the Castle, as a military road, was constructed in the year 1797, and immediately after its completion was handed over to the Dover and Deal Turnpike Trust. Before the making of this road there was no way to the Castle near the cliff side except the old “Monks“ or “Canons“ Path, which, led up the passage beside the St James’ Old Church and by a serpentine route up the hill to Canon’s Gate. After the construction of the new road, a flight of steps, known as the 100 steps, leading direct to the Canon’s Gate, took the place of the serpentine path, and a branch waggon road, higher up, was carried to the same place. Between the old and new roads is a sloping piece of land, formerly known as Stringer’s Field. This was ornamentally laid out and planted with trees in the year 1864, and named Victoria Park. Here a line of noble residences was built with stabling in the rear and lawns in front which commanded fine views over town and port. 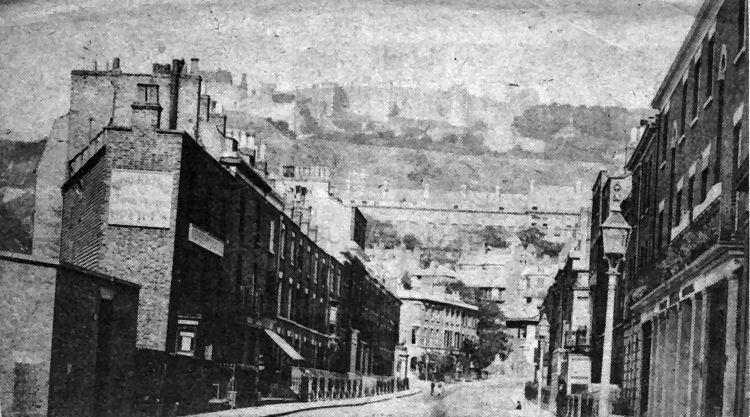 The houses known as Hubert Terrace were the first to be built on the new road to the top of Castle Hill. The gradient of the New Castle Hill Road is much easier than the old way, although still a steep ascent, but the view obtained from the top is worth the effort of walking up the hill. Maison Dieu Road, when first named, extended from Charlton Green to Castle Street, but since the opening of the new road through the narrow passage formerly called Castle Place, Maison Dieu Road extends to St James’ Street. Previous to June 1862,- this road had been described in deeds as Charlton Back Lane, but as the thoroughfare was, at that time, assuming a residential aspect, the new name, deduced from its surroundings — the Maison Dieu Park on the west, and the Maison Dieu Fields on the east - was conferred upon it by the Corporation. The formation of Castle Street in 1830, and the opening of East Brook Place “into the fields,“ suggested an extension of suburban Dover into Charlton. In March 1838, Mr George Pry, builder, of Maison Dieu Park, issued plans and specifications of the Maison Dieu Park Building Estate, and Mr Thomas Robinson offered the building plots for sale at the Royal Oak Rooms. There was no demand then for that building land. The Dover building boom had just then expended itself on the seafront and Castle Street, therefore the Maison Dieu Park scheme had to wait until the town grew and a mastermind arrived to put it attractively on the market. Charlton Back Lane, a mere ten-foot cart track, needed a comprehensive scheme of widening to make the building of good residences practicable. In the absence of the demand for building land, an effort was made to buy or lease the whole of the Maison Dieu Park from Dieu Stone Lane to Ladywell as a public recreation ground and botanical gardens, but Dover in those days lacked the public spirit to give effect to such an idea. The needs of the time, however, were met by Mr Stephen Johnson, who soon after opened promenade and subscription gardens, which extended down the east side of the road, from where Messrs Clark’s nursery later was as far as the Roman Catholic Church. While Mr Stephen Johnson was working his hardest to gratify the public taste for promenading amidst horticultural surroundings and the town council was laudably exerting itself to get the road widened and straightened, the committee for rebuilding St James’ Parish Church purchased the site at the south-east end of the road for their new edifice. A faded picture of Castle Street dating back over 84 years by Snargate Street photographer G. T. Amos. It shows the premises (left) of the old Dover News, established in the street over 110 years ago. Extreme right are the carriage works of Edward Hills & Sons. 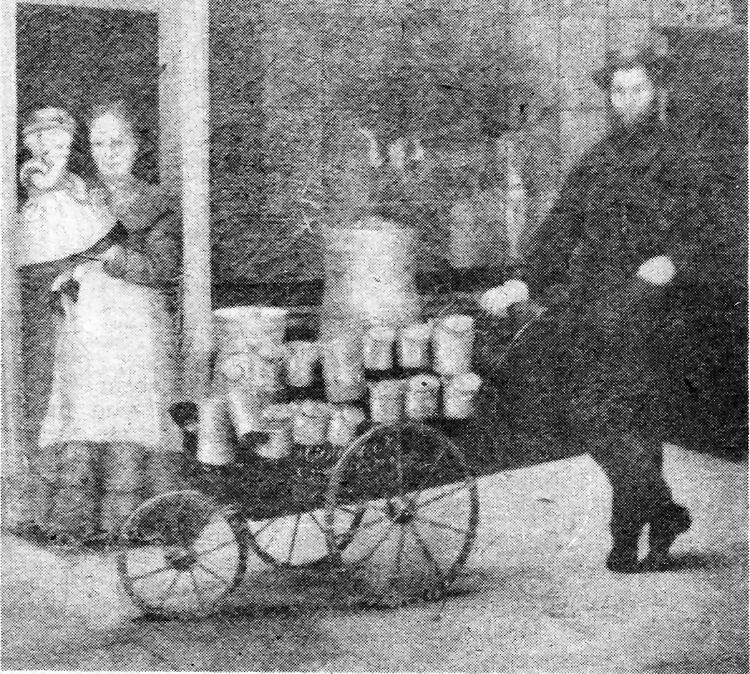 Pictured above is an oil painting of Goldsack, a dairyman, with his peculiar three-wheeled handcart with churns and milk jugs, outside the Dover Dairy thought to have been in Castle Street in the early part of the 19th century. Above is shown a busy scene in Castle Street 50 years ago. On the right Rooms sign above. Close by are the Fleur Tea Rooms and is the confectioner's business of H. S. Bacon with Tea Girauds, the printers, on the corner of Russell Street. Opposite is the shop of Wright the electrician, still in the same premises today, and extreme right are the tobacconists and cycle business of E. Brockman and H. Brockman and Sons respectively.